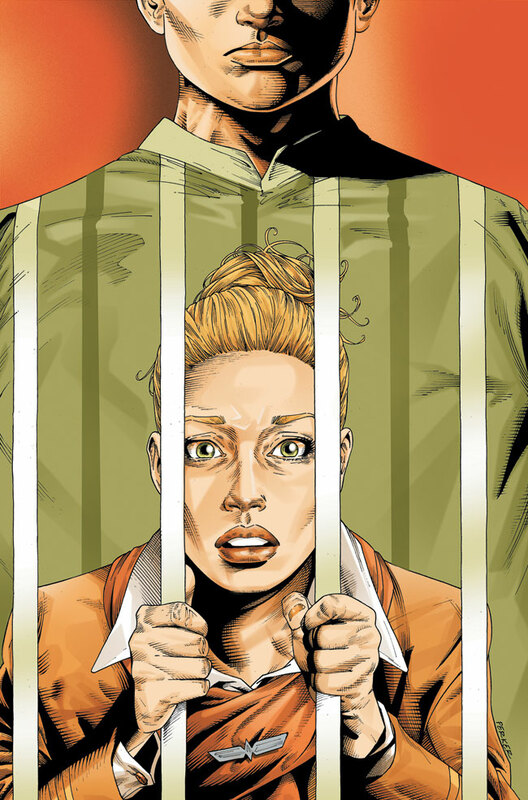 The intriguing AIR #7 comes out this week at a very competitive price from DC, with a 22 page recap of the story up to that point, which should get a few more readers on board. I thought it started strongly enough, and issue 7 is certainly worth a go for the price. PUNISHER #3 (under the ‘Dark Reign’ banner) continues Rick Remender’s impressive start to his run on the title. DC are bringing out TRANSMETROPOLITAN # 1, as part of their ‘After Watchmen, what next?’ campaign. Read Warren Ellis’ views on that here. Finally, WOLVERINE #71 continues the very enjoyable ‘Old Man Logan’ storyline, which features an appearance of a Venom T-Rex…..
As in previous posts here and here, I like to gather up a few of the Walking Dead solicitations and have a look at their spoiler-ific covers. 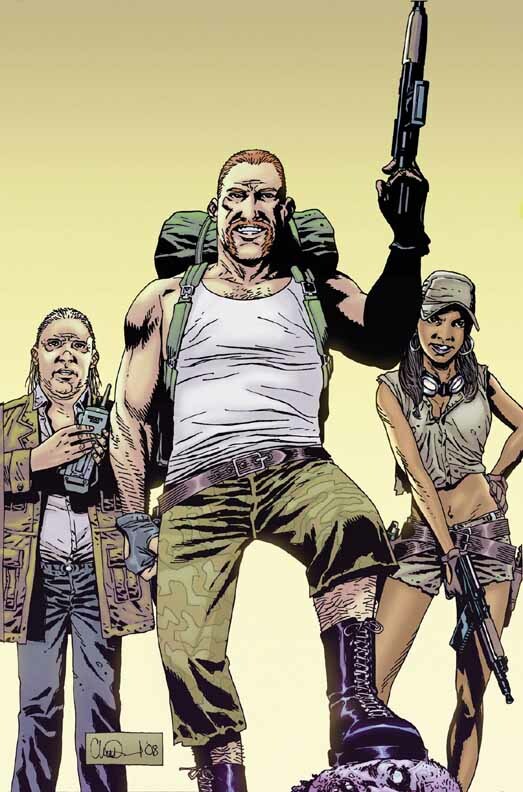 Here is the next batch – numbers 53, 54 and 55, which purportedly take us up to September, but as anyone who gets TWD on a monthly basis knows, this is a very loose time frame and a September solicitation could well be a January 2009 release. A bold statement of intent, a new beginning? 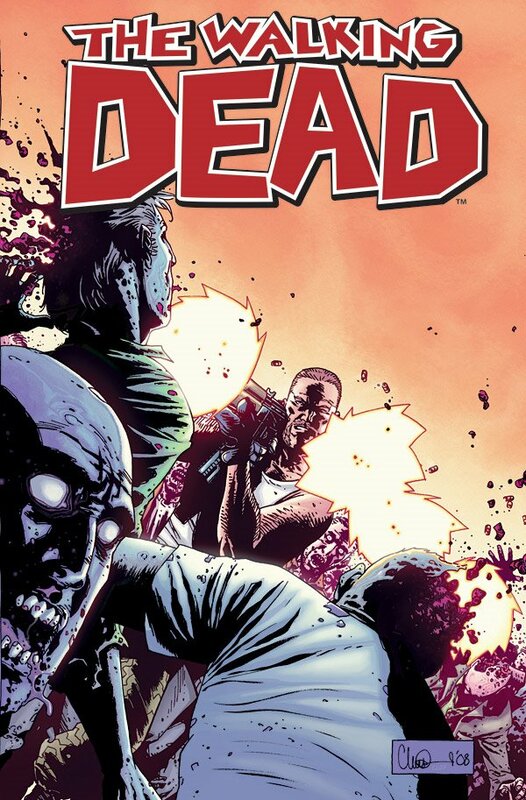 Rick Grimes has now been absent from every cover since his appearance on #49, when he was being led by a determined looking Carl. Is this the start of a whole new perspective on a Zombie ravaged world? Does this cover herald the new order? Are we looking at the new major characters? So many questions, like – are they meeting up with Rick? Carl? Michonne? Are they the Military? Are we about to see the beginning of the fightback against the undead???? The cover art suggests that there are well organised, fully resourced communities out there beyond the limited territory that has been well covered for the last 49 issues. The central character in particular looks a very capable individual, posed like a big game hunter, a decapitated Zombie head under his heel (another graphical signature that states the Zombies are going to be crushed??). 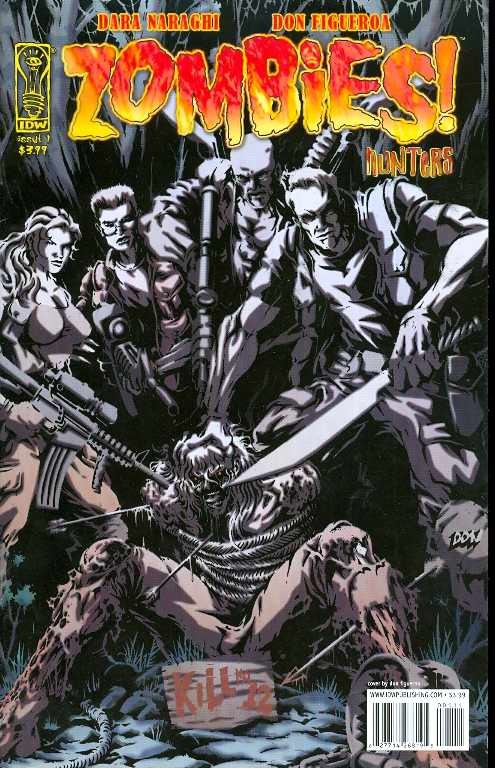 If cover #53 could be likened to an appetiser, then this is the main course – as the solicitation states ‘all out action!’. What else is there to say? Some fantastic kinetic artwork from Charlie Adlard, with the big guy from #53 in full John Woo mode. The revenants are just being shredded in the wake of his fury. The zombie at the forefront looks suitably distressed, even though we have to assume they lack ’emotion’. Even though the big guy is surrounded, you have to assume there is little peril he faces. This is one capable individual. A more reflective cover (in more ways than one – check out the side mirror on that Jeep! ), but with danger lurking. The big guy is still around! The fact they seem to be in open country, with a collection of tents and someone on watch suggests that we are not focusing on any sort of walled community or military compound. Maybe we are going to be focusing on another bunch of ordinary folk in extraordinary circumstances, constantly on the move, looking for food and shelter. The zombies that the reader can see in the side mirror of the Jeep is a nice touch, especially as the background colouring is red, as in RED for DANGER!!! Oh, and still no sign of Rick Grimes. Is this a tease? What gives? 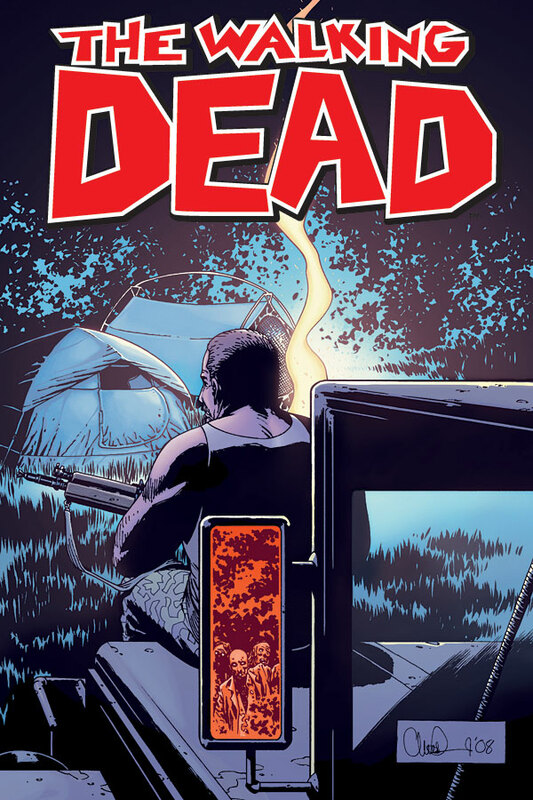 With issue 50 finally due to ship next week (July 2nd), and calculating releases on a one per calender month basis, we can expect to see #55 in December at the earliest, and maybe not until 2009 is any other releases slip. This is one of the most tantalising and frustrating things about hunting for future covers, you have a glimpse of a story, but no real idea what is going on. In the meantime, let the speculation run free!